There is a lot of talk about Ghar Wapsi or Homecoming in India nowadays [Dec 2014], especially by people belonging to the RSS or similar groups who want people of other faiths living in India to embrace a particular religion. I say, great! I am for it too! What, exclaim my friends! You being a Christian are saying this? Ghar Wapsi or Homecoming is all about going back to our original religion, the God whom our very first ancestor worshipped at the beginning, right? If that is so, let us peek back in time, shall we? Where have our ancestors, forefathers come from? 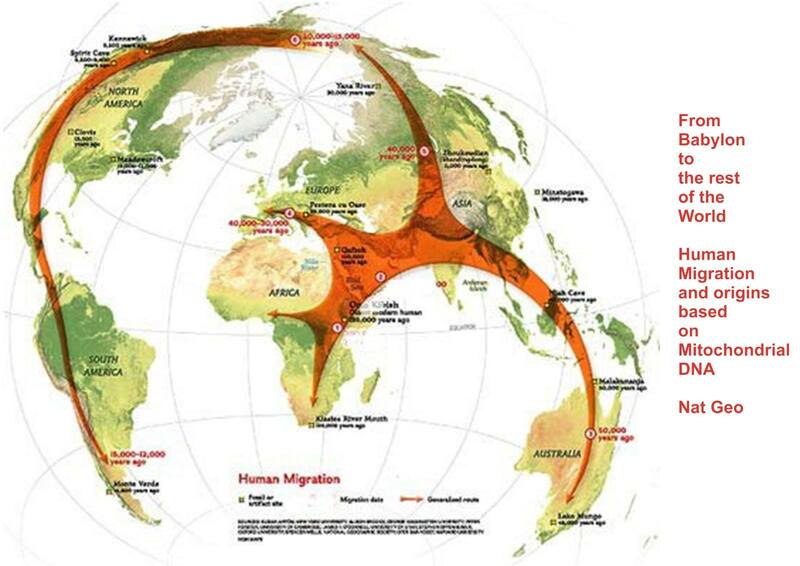 National Geographic did a study on Mitochondrial DNA to study where humans have migrated from. “Every drop of human blood contains a history book written in the language of our genes,” says population geneticist Spencer Wells, a National Geographic explorer-in-residence. Did you know that there are stories of a global flood in almost all the people and cultures of the world, either in written form or oral. The Bible in Genesis also tells us about a global flood around 4500 years ago, ie 2500 BC. Why was there a flood? But Noah found favor in the eyes of the LORD. History tells us that this flood wiped out all humans who existed at that time except for eight people on the ark. After the flood the ark with Noah and his three sons and their wives settled in the region near Mount Ararat. The placing of the catastrophic global flood in the year 2504 BC means that all civilizations discovered by archaeology must fit into the last 4,500 years. Within a few centuries of the flood, humans had spread over the Middle East. After God confused their languages at Babel, around 2200 BC humans spread out to the entire world [Genesis 11:9]. So what is our original religion? God has made man with a heart that loves to worship. We still love to worship anything or everything that we adore or aspire. Some worship money, others power, others a Cricket hero and so on. After Noah, God allowed his descendants the freedom to worship whatever or whoever their hearts desired. That is how religions came into existence. Religion is man trying to reach out to God. What prevents man from connecting with God is our own selfish nature, our heart. That is why the Bible talks about the amazing love of God in reaching out to us humans as Jesus Christ, the Saviour who would rescue us from our sins and shame. Since we are on the topic of Ghar Vapsi or Homecoming, let us come back to Noah our very first ancestor. He worshipped the living God, the Creator of the heavens and the earth! Indians [and the whole of humanity] are descended from Noah and his three sons and their wives who were in the ark with him. That is why I say, I am all for Ghar Vapsi or Homecoming! I say, let us all, all Indians, go back to the original, the God that our very first father worshipped. God is waiting for all of us to return to Him. PS: No one can force or tempt you to accept the real Jesus Christ. Why? Because Christianity is a heart relationship with God through Jesus Christ born out of love. Jesus never promised money, property, jobs or fame, only inner peace, joy, eternal life and freedom from Sin, along with persecution from those who are opposed to the truth! Have a blessed homecoming or Ghar Wapsi, dear reader.